LMR is a UV Resistant Polyethylene jacketed cable designed for 20-year service outdoor use. The bending and handling characteristics are significantly better than air-dielectric and corrugated hard-line cables. LW series is 30% lighter weight than standard LMR by using a copper clad aluminum shield. Weatherability. LMR-600 cables designed for outdoor exposure incorporate the best materials for UV resistance and have life expectancy in excess of 20 years. Low Loss. Size for size LMR has the lowest loss of any flexible cable and comparable loss to semirigid hard-line cables. RF Shielding is 50 dB greater than typical single shielded coax (40 dB). The multi-ply bonded foil outer conductor is rated conservatively at > 90 dB (i.e. >180dB between two adjacent cables). 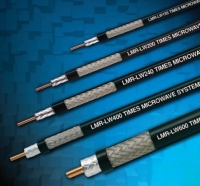 Flexibility and bendability are hallmarks of the LMR cable design. The flexible outer conductor enables the tightest bend radius available for any cable of similar size and performance.